We want to invite you to the Psicoacoustic Test of the Bilbao Project. This test has two parts, the Free Categorization Test and the Listening Test. You can take part on one or both tests. The player could do as many groups as she or he deems necesary. Once finished we will ask the player to explain the reasons of such grouping. It will be a blind test, to let aside any esthetical criteria which could bias the players sensibility. Only the sound of the instruments will be categorized in this test. For this test, the player can use her/his own bow and can even bring his own instrument to use it as a reference. This test will happen from the 3rd to the 14th of December . The 3rd, 4th, 5 th, 10 th, 11 th, 12 th, 13 th and 14 th you can test them during the morning, from 9:00 to 15:00 and the 7th, 8 th and 9 th whole day, from 9:00 to 19:00. The Listening Test will be held the 15th of December in the auditory hall at the JC Arriaga Conservatoire. 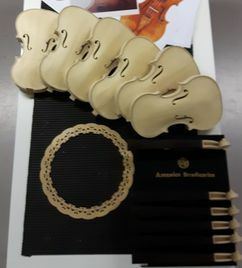 There will be a player on stage testing all the instruments and the audience will be the one judgeing the violins. Here, too, you can take attend and listen and judge the instruments in a concert hall. Instructions on how to judge the instruments will be given before the test beguins. Anyone can take part in this test. Please feel free to tell anyone you know to take part in any of these two tests.